Here’s a new entry into Best (Geek) Dad Ever contest. Everyone knows that children love Ewoks. It’s really the main reason the fuzzy little creatures were in Star Wars at all. Everyone also knows that getting children excited for family vacations that don’t revolve around Disney characters can be difficult. So, when graphic designer Anthony Herrera wanted to get his young daughter interested in their trip to Sequoia National Park, he did the only natural thing: he told her that’s where Ewoks live. Awesome, right? Having grown up in California, I can’t imagine how every kid driving through Sequoia National Park doesn’t automatically assume Ewoks live there, or why the park doesn’t already capitalize on the similarity between it and the forest moon of Endor. 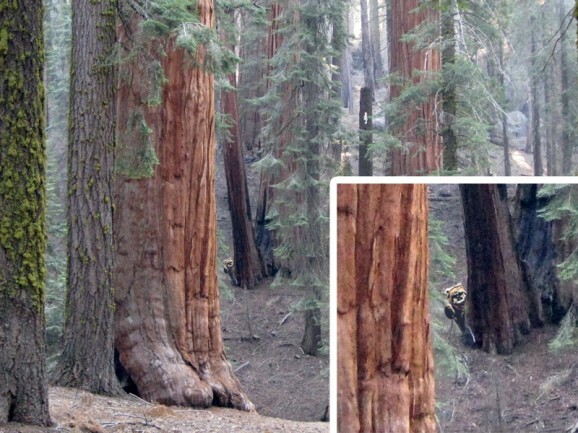 There was one little flaw in the plan that you might have noticed, though: there are no Ewoks living amongst the sequoias. The family spent much of their time hiking in the ancient woods “looking” for Ewoks, after which the little Star Wars fan was understandably disappointed. Herrera tried to explain that Ewoks are just really shy, but that’s little solace for a broken-hearted child. And it’s here, when dad tries to make it up to disappointed daughter, that the story gets extra adorable. After we got home, and after I had a little time alone with the photos, I told her I thought I saw something strange in a few pictures. We viewed them on the TV to get a larger image. You can imagine how surprised and excited she was when we discovered that we didn’t see any Ewoks, but they saw us, and had certainly taken an interest in her and her little brother. You can see more of the photos over at Herrera’s website, and the fuzzy little creatures are easier to find in some of the pictures. The only thing missing from this scenario is a reaction video of when she saw the new photos, a la the kid learning about Luke Skywalker’s parentage. Everyone knows children love Ewoks? Children don’t know who Ewoks are except for the children of pathetic social outcast parents who are trying to force their nerd-dom onto their kids. Or children who have seen Star Wars. No reason to be so bitter. Dude that is truly amazing, ver cool dad indeed. Lighten up! I’m with you on lying but it seems a bit extreme to apply that here. This is little more than storytelling with flair. so how do you explain santa?